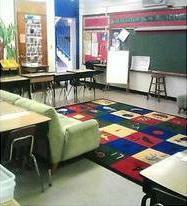 A new study just emerged today about classrooms in the U.S.
American classrooms (especially ones in early childhood education), are always jammed packed with posters, art work, fun bulletin boards, pictures on the carpet, decorations on the windows, etc. with the theory that young children are like sponges who absorb absolutely everything around them at an early age. 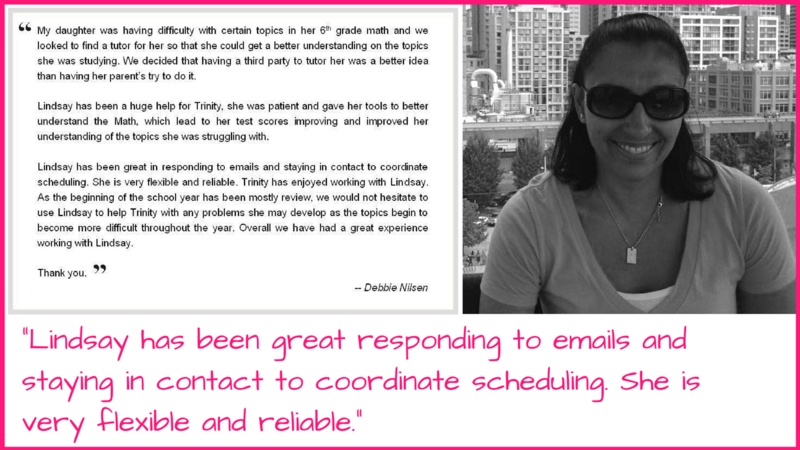 Although it is most likely the case that young children absorb quite a bit of information that surrounds them, there is a point where their surroundings actually are too stimulating – to the point of distraction and, therefore, less retention of new concepts. Researchers in the US find that children are more likely to lose concentration and score lower test scores when classroom walls are covered with over-elaborate displays. Teachers should consider taking down over-elaborate classroom displays amid concerns maps, artwork and photographs damage children’s education, according to research. Researchers said highly-decorated walls in primary schools undermined pupils’ ability to concentrate during lessons and absorb teachers’ instructions. The study, published in the journal Psychological Science, found that children educated in “sparse” classrooms spent more time “on-task” and gained higher test scores. Academics from Carnegie Mellon University in Pittsburgh, US, insisted they were not advocating a ban on classroom art work but said teachers should consider “whether some of their visual displays may be distracting to young children”. Anna Fisher, associate professor of psychology, who led the study, said: “Young children spend a lot of time – usually the whole day – in the same classroom and we’ve shown a classroom’s visual environment can affect how much children learn. As part of the study, 24 primary school pupils were placed in laboratory classrooms for six introductory science lessons on unfamiliar topics. 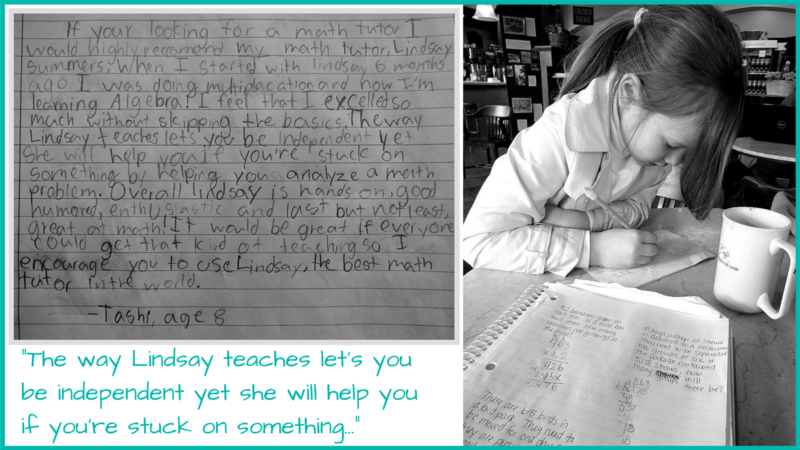 Three lessons were taught in a heavily decorated classroom – those filled with maps, number lines, shapes, artwork and other materials – and three lessons were given in sparse surroundings. The study, in the journal of the Association for Psychological Science, showed that children learned in both classroom types, but picked up more when the room was largely free of wall displays. Children accurately answered 55 percent of test questions taken in the sparse classrooms compared with 42 per cent in highly-decorated rooms. 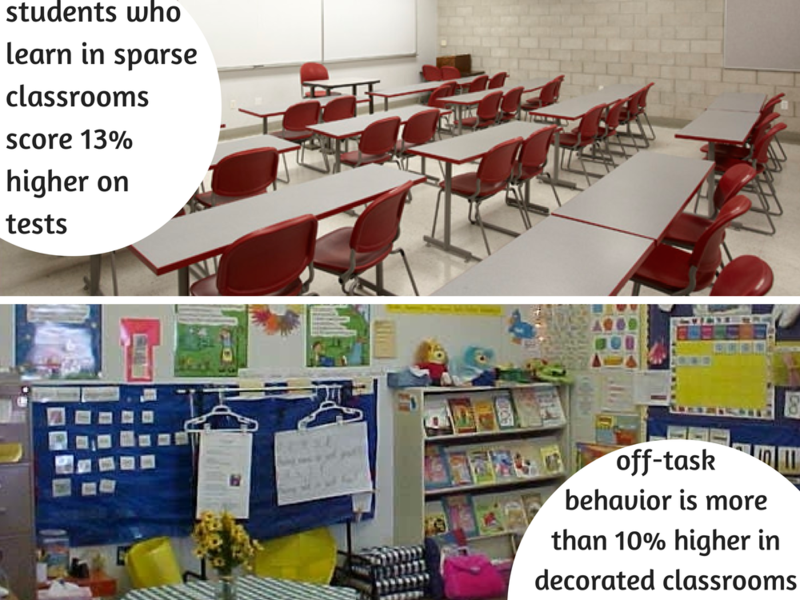 It also emerged that the rate of “off-task behaviour” was higher in the decorated classroom (38.6 per cent) than in the sparse classroom (28.4 per cent). Prof Fisher said: “We do not suggest by any means that this is the answer to all educational problems. Furthermore, additional research is needed to know what effect the classroom visual environment has on children’s attention and learning in real classrooms. The researchers hope the findings could lead to further studies into developing guidelines to help teachers improve the design of classrooms, including removing some excess clutter. But it was claimed that children in sparse classrooms may find other ways to allow their mind to wander. 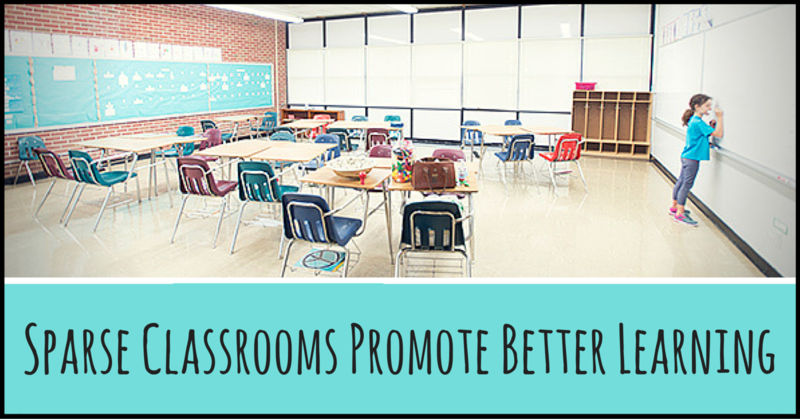 What do YOU think about decorations in classrooms? Do you think your classroom is too overwhelming, but if it were perhaps “underwhelming,” that it might be viewed as “not engaging”? In your school, are you required to decorate your classroom with a lot props, or are you allowed to have a completely white classroom? 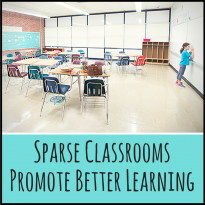 Share the post "Sparse Classrooms Promote Better Learning!"